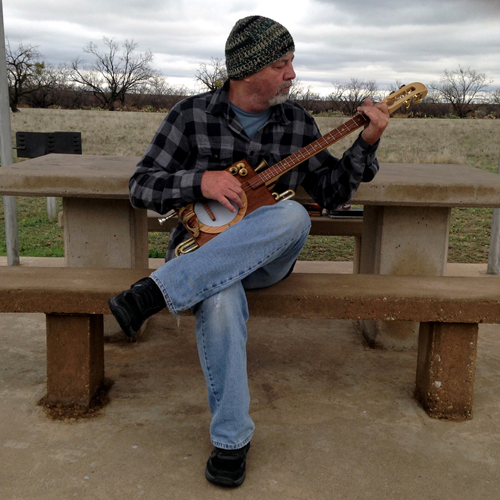 Mark W. Clark is a graphic/web designer by day as well as musician, photographer and artist. 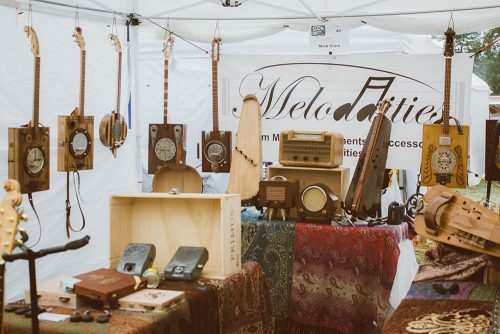 Mark’s “meloddities” combine elements of depression-era tramp or folk art with the love of playing music. These are one-of-a-kind functional, playable art pieces using reclaimed, re-purposed “found” objects so they become impossible to mass produce or replicate. 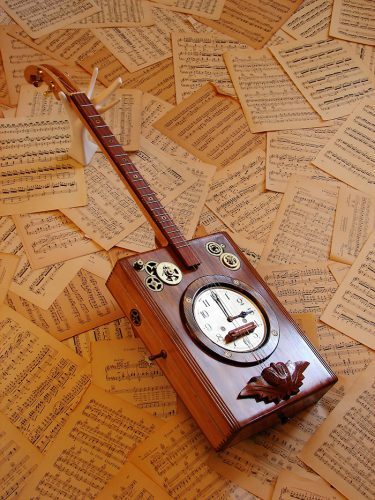 Many of the pieces incorporate used cigar boxes and antique violin cases along with hand-tooled or hand-carved wood such as oak, walnut, maple and jatoba. Mark’s manifesto is simple. “Though I want my pieces to be visually compelling and unique, each instrument has to sound good and be relatively easy to play. 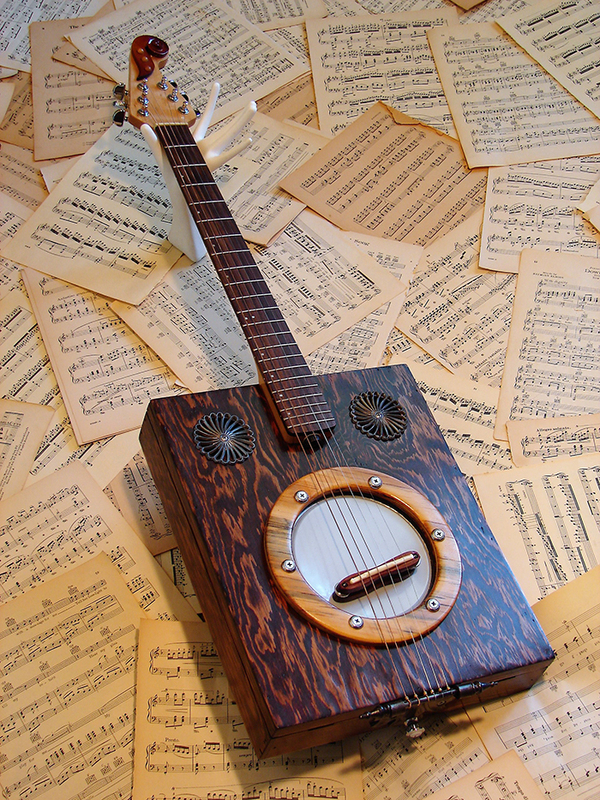 I won’t make something that looks cool but doesn’t produce good sound or is difficult to play. They are musical instruments. You have to play them, not just hang them on the wall. Just like you don’t know what voice a baby has until he makes is first cry, you don’t discover the voice of an instrument until you first put strings on, tune and play. That’s the joy! Mark began playing a $5 Sears Silvertone guitar at age 7 after a brief encounter with The Beatles on The Ed Sullivan Show. Later, a love of antique restoration, wood working, garage sales and dumpster diving produced other trashed treasures such as furniture, wall art, and various sculptures. Also a writer and photographer, Mark received his Bachelor of Science in Journalism and Graphic Arts from East Texas State University in 1980. 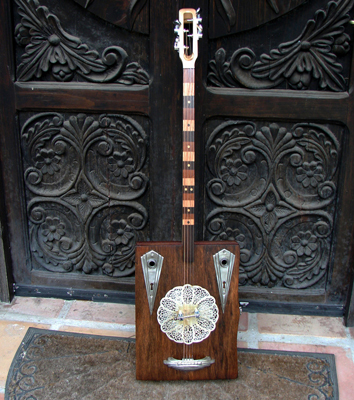 After being in awe of a fellow artist/musician friend who began building his own instruments, Mark came across a cigar box at a garage sale. From that one dollar purchase, he began designing, building and playing his own creations.